Bite Size Bible Study: Which Old Testament Laws Apply Today? 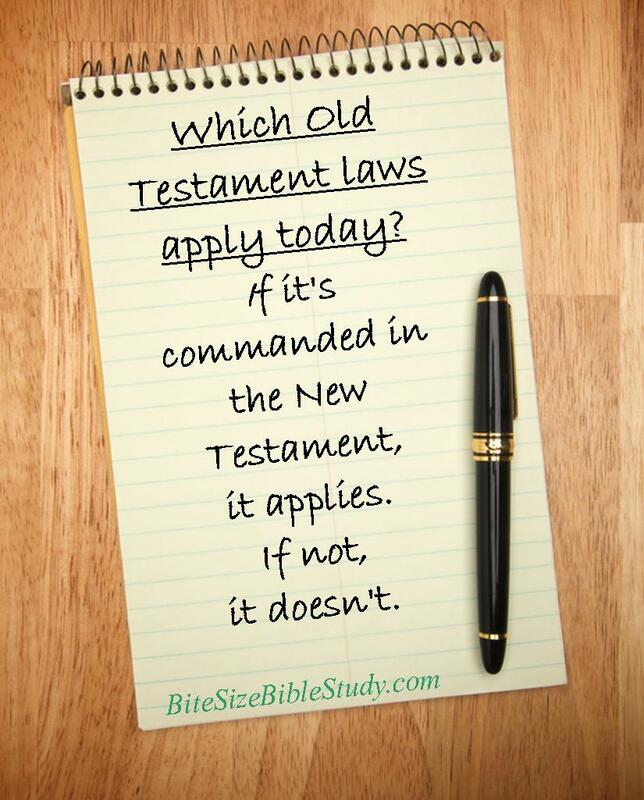 Which Old Testament Laws Apply Today? “When a woman has her regular flow of blood, the impurity of her monthly period will last seven days, and anyone who touches her will be unclean till evening." These are two of the hundreds of Old Testament laws that Christians don’t follow. But why? How can we determine which Old Testament laws apply to us today and which don’t? Some Bible scholars divide laws into moral, civil and ceremonial. They explain that moral laws are for all time, while civil and ceremonial laws were specifically for Old Testament times. Unfortunately, there is some disagreement about which laws fit into which category. The easiest, surest, way to know if an Old Testament law applies to us today is this: If it's commanded in the New Testament, it applies. If not, it doesn't.